In Colorado, “April showers brings May flowers” means next to nothing. They have been getting feet of snow then 80 degree weather this month! In NYC the saying is pretty accurate. Springtime in the city really does feel like spring. The trees here are so pretty with beautiful blooming flowers! I don’t want to jinx it, but I think the summer heat is finally dying out; of course now that I said that it will probably be over 90 next week. 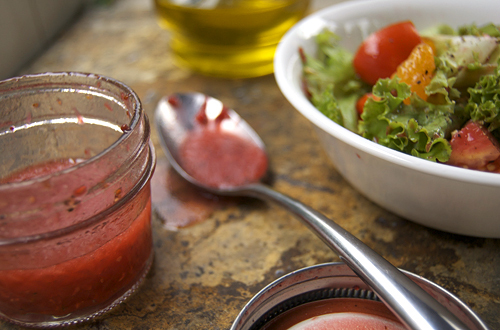 That’s ok though because you need a few more hot sunny days to try this sweet vinaigrette recipe! I got the idea from the blog Coconut & Lime and figured it would be perfect for a nice sweet summer salad. After hearing about my plan to eat healthier, many of you voiced your desires for me to continue posting my comfort food posts. As much as I would love to be able to eat like that every day and not gain a hundred pounds, I can’t; but there is no need to worry! I stand before you with a recipe to prove that healthy can be just as delicious as all of my comfort food recipes. This recipe is filled with nutritious vegetables and healthy fish, no cheese or empty carbs here, but I can guarantee that it has more flavor than most meals. I chose not to eat a starch with this meal, but it would go very well with a jasmine rice or white rice. 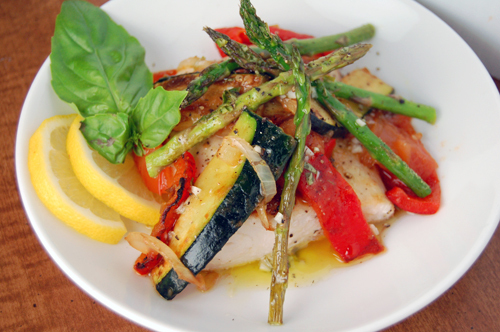 The vinaigrette adds a delicious citrusy bang to the vegetables and fish. Some of you may know, I recently was given a cook book called Raising the Salad Bar by Catherine Walthers. It is a great book that I recommend all of you take a look through at some point. It tells you about all the different sorts of leafy greens and types of salad toppings, as well as how to make all sorts of dressings. Either way, the book motivated me to make more unique salads. I usually find myself putting the same vegetables in every salad I make, despite what else I am eating it with. Now I have realized that choosing a salad that compliments a meal can make a huge difference. With that said, this salad is much different than most I have made. I came across this recipe in a Cooking Light magazine while bored at work the other day- yes I spent half of my day at work reading cooking magazines… Shh! One thing that makes this salad unique is its warm vinaigrette. 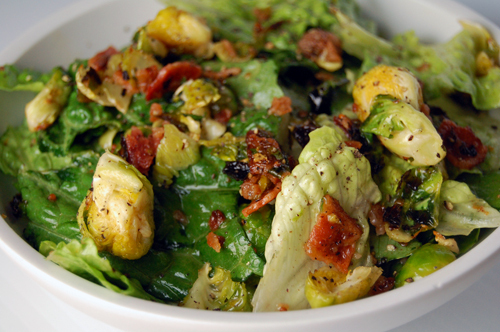 This dressing went perfectly with the roasted Brussels sprouts. The bacon and maple syrup also added a ton of flavor. This is one salad that did not need a ton of toppings to complete it. I even ate it as a complete meal the next day!